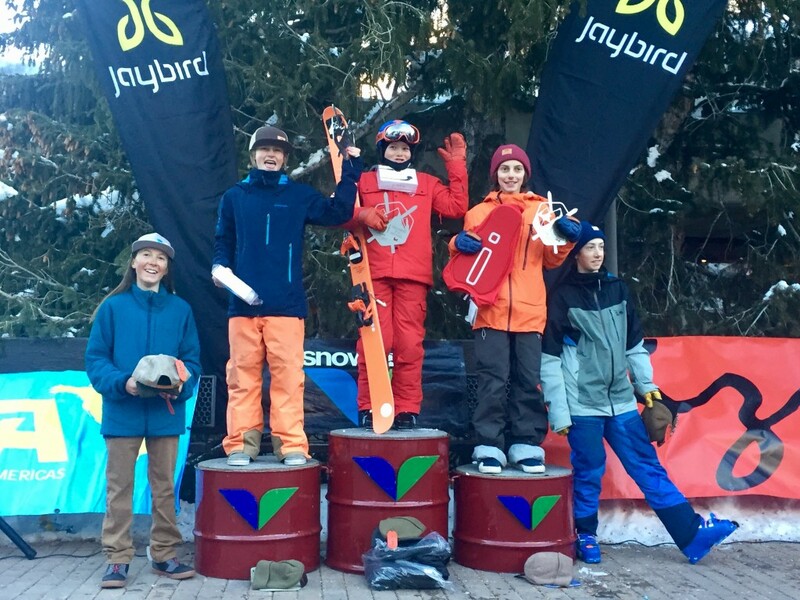 A crew of junior freeride athletes had their first IFSA big mountain competition of this snowy season at Snowbird, Utah this past weekend and they put in some serious work. Local shredder Brooks Hudson made the trip as well as 5 Crested Butte Mountain Sports Team athletes including Avery Bernholtz, Ella Haverkampf, Carson Hildebrandt, Holden Bradford, and Nate Ball. 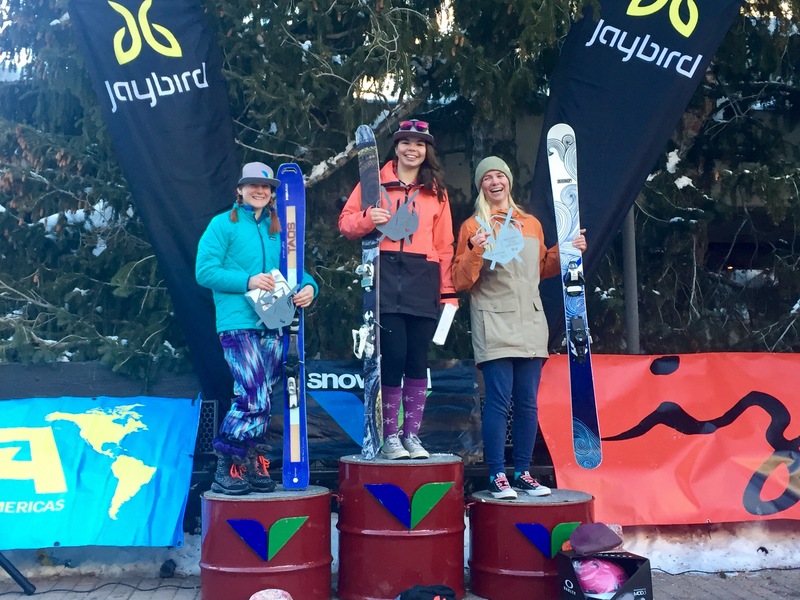 The young athletes had their work cut out for them against some of the best competition in the country on the famed venues of Silver Fox and North Baldy at Snowbird. When all was said and done 5 of the 6 athletes would end up in the top 5 and Brooks Hudson and Avery Bernholtz would both take 1st place in their respective 12-14 male and female ski divisions. Above photo: Crested Butte’s Brooks Hudson took first in the 12-14 boys ski division with CBMST’s Carson Hildebrandt in 2nd, Tanner Moller of Team Summit in 3rd, CBMST’s Holden Bradford in 4th, and Altabird’s Liam O’Reilly in 5th. Avery Bernholtz topped the 12-14 girls podium with Charlie Ulrich of Taos in 2nd and Ella Haverkampf in 3rd. The action kicked off on the time-tested Silver Fox venue on Saturday. Snowbird had received a lot of same recent snow that we have experienced in Crested Butte so the venue was exceptionally filled in for this time of year. Ella Haverkampf was the first Crested Butte athlete down the venue and she put down a solid run that put her in 5th place out of 19 athletes. Avery Bernholtz followed shortly after and impressed the judges with a high-speed straight line to cap off her run and finish the day in 1st place with a nice 2-point cushion going into finals. On the boys side of things, Brooks Hudson confidently laced turns down Silver Fox popping off as many features as he could to put down the stand-out run of the day that put him in 1st of 47 athletes and gave him a 2-point lead as well going into the finals. Carson Hildebrandt had a great run going and went for a big air at the bottom of the venue reminiscent of Oz Scott a couple years ago. Carson didn’t have a clean landing when he almost hit a bush and finished in 11th. Holden Bradford put down a strong run to make the cut in 15th place. Nate Ball hit some challenging features and made great turns down the venue but unfortunately had a costly bobble as he was moving through trees and did not make the cut for finals. North Baldy, a venue that hadn’t been used for juniors since 2011, would play host for the finals on Monday after the older athletes had their day 1 on Sunday. Ella knew she had a little work to do if she wanted to move up to the podium and grab valuable points for her overall ranking. She made hard-charging turns down North Baldy where some other athletes showed hesitation and was able to move up 2 spots to slide into 3rd place. Avery knew that with her two-point cushion she had to stay on her feet but stay aggressive to fend off the other competitors. She found another high-speed straight line through the majority of the lower section of the venue known as “The Amphitheater” and took it all the way to finish to hold on to 1st place. Sitting in the middle of pack, 4 points off the leader, Holden was in a great position to go for it. He topped off his technical run with a super-fast straight line double through the Amphitheater that was the 2nd best run of the day only to his teammate, Carson. Carson flashed a similar line to Holden’s but sent a huge air on the looker’s right of the venue. Both boys made major moves with their strong runs and Carson would move all the way up to 2nd place and Holden to 4th. Using his lead in from day 1, Brooks stuck to the game plan and showcased his dynamic style with the 3rd best run in the finals and a strong air in the Amphitheater to seal the deal and take home the cumulative-point victory against some of the stiffest competition in the west. 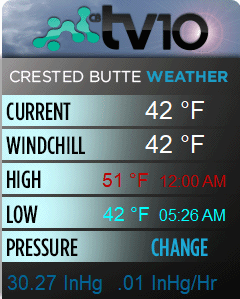 It looks like an exciting season is shaping up for these young Crested Butte athletes. Next up for some of the older CBMST shredders is a regional in Telluride on January 21 followed by an all-hands-on-deck effort to defend our home turf at CBMR for the regional over the February 4-5 weekend. See you out there!